Information Resources will be performing updates to the ROYALSECURE wireless network on December 15. As a result, you will need to update any wireless devices (cell phones, tablets and laptops; all operating systems) connected to this network prior to the change. Devices that are not updated before December 15 may no longer be able to connect to the internet and could display a warning about the network being untrusted when connecting. Desktop computers and gaming devices do not need to be updated at this time. Questions? 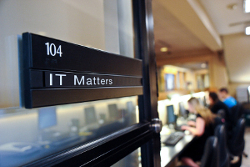 Please contact the Technology Support Center at 570-941-4357 or techsupport@scranton.edu. Posted in IT News, Security and tagged wireless update. Bookmark the permalink.